In 2002, Mike Cannon-Brookes and Scott Farquhar went into $10,000 of debt to release an issue and project tracker named Jira—a reference to Gojira, the Japanese name for Godzilla. Seventeen years later, Cannon-Brookes and Farquhar are owners and founders of Atlassian, an enterprise software company that employs over 3,000 people in six different countries and generates hundreds of millions of dollars in annual revenue. As a major player in the enterprise software industry, MBAs with a keen interest in tech would do well to explore Atlassian. We reckon they will like what they see. Atlassian is widely considered to be one of the best companies to work for. It is, in fact, certified as a “Great Place to Work”. To start, employees are paid extremely competitive wages. According to Glassdoor, product managers—the positions that most MBAs occupy—are paid on average $136,000 annually. In addition to the salary, employees receive numerous benefits and perks. The benefits start for employees before they have even claimed their desk. The company allows new hires to take a vacation to a destination of their choice before they start their position. 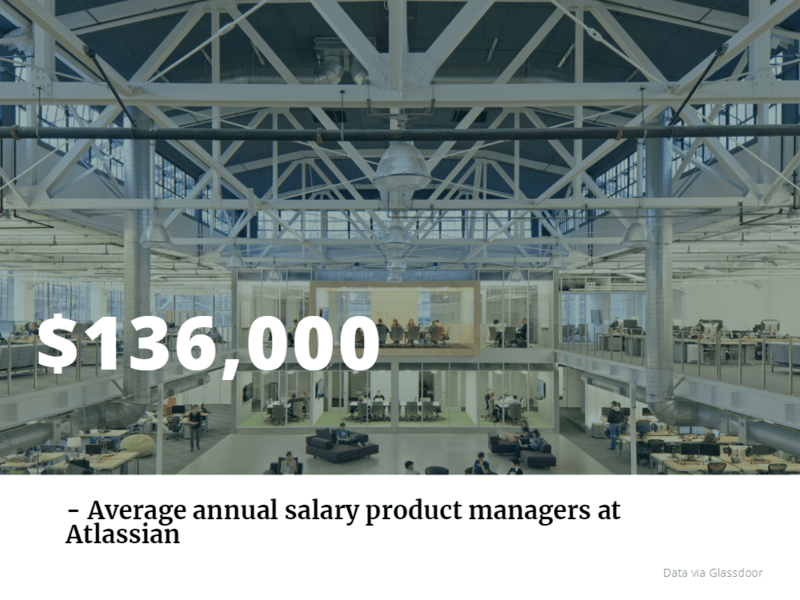 Atlassian covers many major costs for its employees. For example, health care is completely free. In addition, Atlassian provides $600 to cover its employee gym memberships. Along with these health benefits, employees have a budget with which to attend conferences and take continuing education courses. Employees can also take up to five days a year to work for a community service organization of their choice. In addition, there is unlimited vacation. Atlassian prides itself on maintaining a strong work-life balance and giving its employees flexibility. Some employees will work from the office, while others will stay home and work remotely. As one might suspect of a tech firm, the atmosphere in the office is extremely relaxed, with people in casual attire and working where they desire. Some might even take time away from their desk to partake in a yoga class or share a beer with their colleagues, with both the class and the keg provided by the company. To land a job with Atlassian, potential candidates must understand what these values mean and then show the Atlassian staff that they embody them. This ability will be as important—if not more so—than any technical skills. In terms of programs, there is an associate product manager program that allows new graduates to learn the ropes over the course of one to two years. The general interview process consists of a written component, where applicants submit responses to questions posed by Atlassian. After approval, successful candidates are invited to interview at their a local office. This interview is usually in two parts and does not take longer than other interviews. During the interview process, Atlassian assesses the candidate’s skills as well as their understanding of the company’s culture. As mentioned above, a cultural fit is as important as a skill fit, so any candidates considering applying must understand the Atlassian culture. Embodying these values will give candidates an advantage over others.